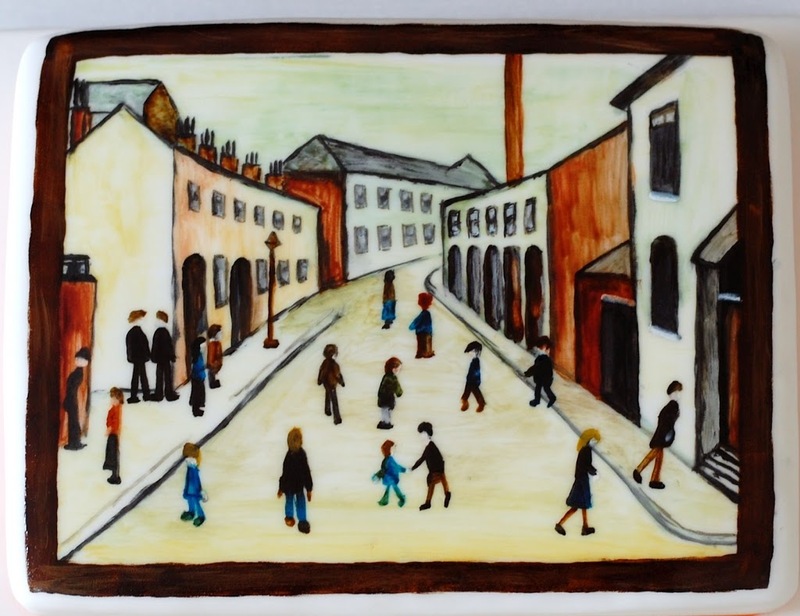 My dad was a big LS Lowry fan, and I remember there were prints of his paintings hanging on our walls when I was a child. 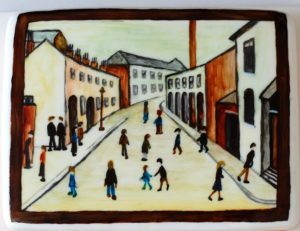 I was delighted to be asked to make a cake featuring one of his works, though a little worried about painting all those tiny figures that filled the streets in the paintings I was familiar with. I had to find one that didn’t have too many millions of figures in it, or copy a detail rather than a whole painting. Unfortunately I didn’t make a note of the name of the painting I chose. I have lost a few figures along the way, mainly because it was a very labour intensive cake to work on and time was running out, but also because I needed much smaller paintbrushes to achieve anything like a good likeness of the smaller figures. This was a fairly large cake, but still a small ‘canvas’ for any tiny painted detail. I have new paintbrushes now though, and would love to have another go some time! Viewed from above as it is, this doesn’t particularly look like a cake, but it is, I promise. Thanks Jane. Nearly two years since we went to the Lowry exhibition!